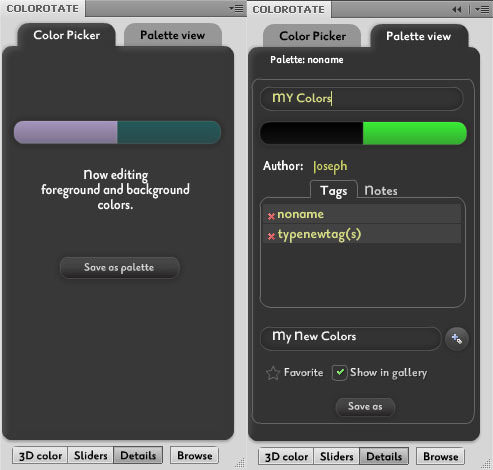 When editing a palette, choose “Details” at the bottom of the plugin panel to set tags and notes. If you are currently in “Color Picker” mode, you can convert the current foreground and background colors into a palette. Here, you can save your color palettes on your hard drive and online, where you can show it to your clients, colleagues, and friends. You can also add tags and notes in your palettes. Saving color palettes in the Color Picker and Palette View. Details Mode works only for the Palette View. You can save your edited colors in Palette View. If you want to set details for your foreground and background colors, click “Save as palette” to convert to a palette, and then you can set tags, nodes, or save.